"Membranipora Membranacea" . An encrusting Bryozoa of Seaweeds . 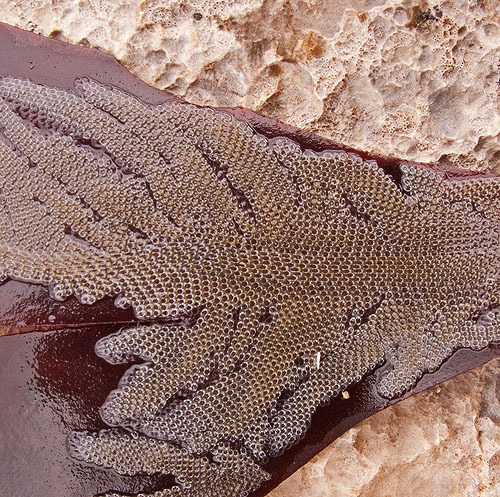 Bryozoa are tiny colonial organisms that occur as growths , resembling Lace , on seaweeds, rocks and wherever else they can get a foothold, even boat hulls. Bryozoa form dense colonies , with each individual having its own small chamber . They feed by using their tentacles to draw in minute particles to their mouth. As they do not require light, it allows them to colonise habitats, away from competition with algae.